Mars and Antares reach conjunction on this date. As Mars drifts eastward through the fixed constellations of stars, it will pass very close to the star Antares. At conjunction, they will have the same right ascension in the sky. Right ascension, along with declination, provides something like the (X,Y) coordinates on a graph, or longitude and latitude on a globe. The graphic is a computer simulation of the sky for September 28. Sky Chart tells me this is the time of closest approach. Closest approach is not coincident with the time of conjunction, since the motion of Mars is inclined by around 30° to the right ascension coordinate grid. Bottom line: Mars and Antares will be next-door neighbors for about a week centered on September 27, so you’ll have more than one evening to catch this near pass. I should note that, although they appear close to each other in the sky, this is a geometrical alignment only. Antares is 40 million times more distant than Mars. No worries about any collision. Enough astrometric details. The cool aspect of conjunctions is that two (or more) relatively bright and distinct objects will be very close to each other, providing a visual delight, and an opportunity to photograph all in the same field of view (FOV). 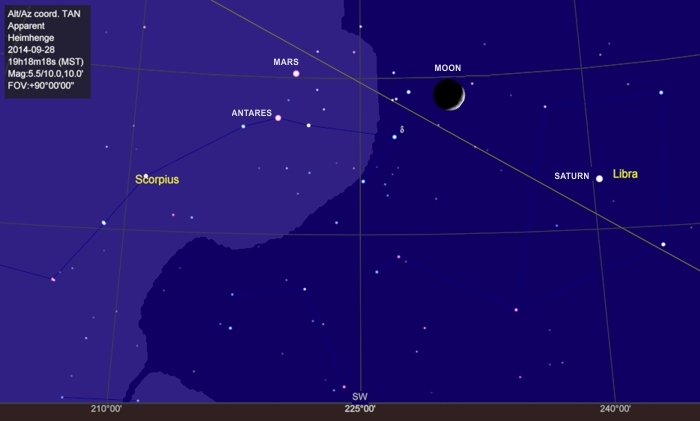 On September 29 (tonight), Mars and Antares will be joined by the Crescent Moon in a triple conjunction. I’ll attempt to photograph this triple, and if I get a good shot, will provide a link in a future post. At conjunction, Antares will be shining at magnitude +1.3. Mars will be slightly dimmer, around magnitude +1.8. Both will show a definite reddish hue compared to other objects in the area, making them easy to spot. One difference you should look for is that Antares will be “twinkling,” but Mars will show as a steady dot of light. To learn more about why that happens, see my May 7, 2012 post: Why Stars Twinkle, and my Aug 3, 205 post: To Twinkle or Not. Antares, officially known as α Scorpii, is the brightest star in the constellation Scorpius. The name “Antares” is derived from the Greek “anti-Ares” meaning “rival of Mars.” Ares is the Greek name for Mars, the god of war, so-named for its blood-red color. In the weeks following conjunction, you’ll observe Mars moving rapidly eastward through the constellations. Its apparent speed through the sky is due to its proximity to Earth — a mere 78 million kilometers (48 million miles). So get outside about an hour after sunset, when the sky has darkened, and look for Mars and Antares in the southwest. Their elevation will be only 20° above the horizon (at Arizona’s latitude of 34° N). That’s a little low, so Arizonans will need clear skies and an unobstructed view of the horizon. Farther south in latitude the pair will be higher in your sky and even easier to spot. At latitude 24° N, for example, their elevation will be 30°. At latitude 36° S (e.g., Argentina, South Africa, Australia) they culminate near the zenith — elevation 90° and straight up overhead.